Kevin Ledo has painted his biggest mural ever for Montreal's Mural Festival honouring a hometown hero — and he's feeling the importance of the job. Mural Festival is an annual staple of street art in Montreal. And this summer, it continued its tradition of bringing stunning public art to its Plateau neighbourhood. 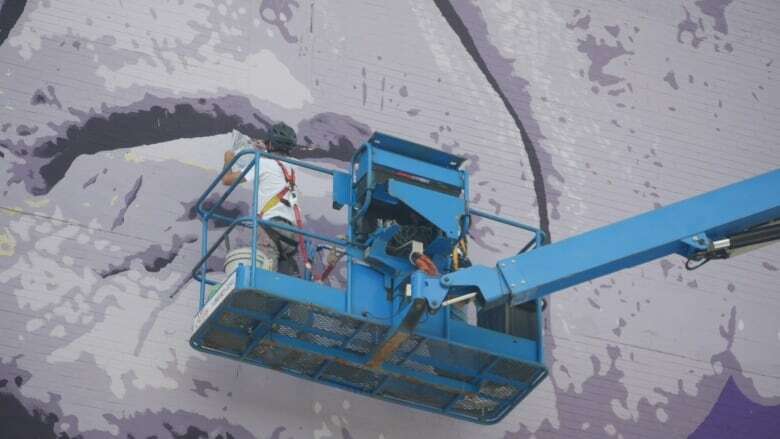 One of the artists working feverishly from atop his cherry picker was Kevin Ledo, a street artist renowned for his portrait murals. For Mural Festival, Ledo had a particular challenge — working on a far larger scale than he's been used to, and memorializing the late icon Leonard Cohen in Montreal's Plateau. Under the watchful eye of passersby and residents of the community, Ledo set out to do Cohen justice and bring something of the legend's spirit back to his home. Today, on what would've been his 83rd birthday, take a moment to celebrate a true Canadian legend. Find out more about Mural Festival here and follow Kevin Ledo here. Watch Exhibitionists on Friday nights at 12:30 a.m. (1 NT) and Sundays at 3:30 p.m. (4 NT) on CBC Television.